The last few months have been as gentle as a lullaby for investors, with pretty much every asset class gently floating up. Even emerging markets are back in favour, swelling by 6% last quarter – a gain that’s underlined by the lagging indicator of numerous media sites now banging on about BRICs. Even so, the emerging markets remain uniquely in the red out of all the asset classes we’ve invested in since we started the portfolio some three years ago. Overall our model portfolio has endured very little hardship over that time, aside from trailing the FTSE All-Share by some 2% a year. Every market we’ve owned bar the US and Europe has underperformed the UK equity market. Diversification has seemingly cost us over this short period. But the point of an asset allocation strategy is that you stick with it through the years – and even the decades. We believe it will prove its worth when the weather changes. 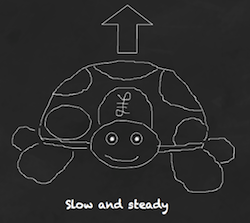 The Slow and Steady portfolio is Monevator’s model passive investing portfolio. It was set up at the start of 2011 with £3,000 and an extra £850 is invested every quarter into a diversified set of index funds, heavily tilted towards equities. You can read the origin story and catch up on all the previous passive portfolio posts. Our little growth engine has made another £400 since our last portfolio update. That means we’re up over 18% on purchase and have averaged a 8.28% annualised return. Interest and dividends brought in £77 last quarter, as we accepted the tribute of entrepreneurs and the Government for the gracious favour of our capital. We reinvest this income straight back into our portfolio via accumulation funds that automatically put that money back to work. A switched-on passive investor is rightly paranoid about cost – this being one of the few factors she can directly control that makes a material difference to the bottom line. So I’ve been wondering whether the Slow & Steady portfolio should switch to the incredibly cheap family of index funds available from Fidelity after that firm’s most recent bout of price smashing. Note: OCFs are percentage figures. 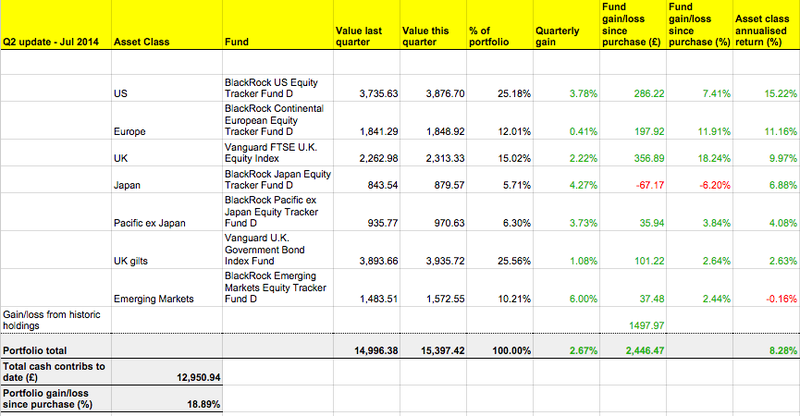 The current annual cost of our portfolio’s funds is 0.18%. If we drafted in the Fidelity funds then this would fall to 0.13%. That’s a near 30% reduction in costs. But let’s keep some perspective – it only amounts to a £7.50 annual saving on our portfolio’s approximate £15,000 value. That’s definitely not worth the bother. Moreover, it doesn’t take into account tracking error – the additional costs a fund spews like exhaust fumes, and which aren’t measured by the OCF. Some of the Fidelity funds are very new, so they don’t have a track record that we can even probe. But one we can look at is the Fidelity Index UK fund, and here the apparent advantage of this fund over our current UK holding is certainly not as wide as it first appears. The 0.08% OCF advantage is reduced to a miniscule 0.01% rounding error once tracking error is accounted for, according to Trustnet’s charting tool. So for the moment, I’m not going to make any changes. But that isn’t to say you wouldn’t do perfectly well with these Fidelity funds. Every quarter we lay another £8501 at the feet of the money gods. We use Larry Swedroe’s 5/25 rule to trigger rebalancing moves. All’s quiet for now, so there isn’t any need to sell any outperforming funds. This model portfolio is notionally held with Charles Stanley Direct. You can use its monthly investment option to invest from £50 per fund. Just cancel the option after you’ve traded if you don’t want to make the same investment next month. Take a look at our online broker table for other good platform options. Look at flat fee brokers if your portfolio is worth substantially more than £20,000. If all this seems too much like hard work then you can always buy a diversified portfolio using an all-in-one fund like Vanguard’s LifeStrategy series. – selling ‘high expense’ funds (eg EM’s) from my SIPP/ISA and ‘buying’ ‘high expense’ funds within my ‘expensive’ workplace insurance company based pension. At the same time I’m using the proceeds to buying ‘low expense’ funds (eg gilts) in my SIPP/ISA and ‘selling’ ‘high expense’ funds within the workplace pension. It’s taking the poise and dexterity of a ballerina to ensure I’m not out of the market for any length of time plus am not eaten alive by buy/sell spreads and trading costs but having done the months it will take my average portfolio annual expenses from 0.37% to 0.33%. Doesn’t sound like much but with me now having 76% of the wealth required for Early Retirement it’s worth hundred’s of pounds a year and so is certainly worth the few hours of time I’m investing into it. I don’t want to be a doomster, Retirement Investing Today, but what do you mean that you already have “76% of the wealth required for Early Retirement”? Not if it stays in the market you haven’t! Or do you mean you have “banked” your “at-risk” investments as liquid cash? If so, you are probably right; if not, there is always the distinct possibility of a sell-off permanently impairing your “76%”! I have nothing against being invested in equities and bonds, per se, but am very curious as to how your arrive at your 76% figure with any degree of certainty going forward. I’d be interested to learn of your techniques. I find the 6.5% annual really spooky – isn’t that nearly precisely the annual return that this portfolio mix should generate in line with long term averages with CPI averaging about 3% over the period? It’s difficult to explain in a brief comment without diverting away from TA’s post but here goes. The 76% is arrived at by dividing 2 numbers. The first is the amount of salary I want in retirement which includes compulsory and discretionary spending. The second is the current value of my assets. As soon as the result is <=2.5% I believe work can become optional for me (maybe not for others) as I can manage whatever the market then throws at me providing it reflects no worse than history. A black swan event that is worse than anything ever seen previously in the UK and I'll be back peddling on that discretionary spending and/or hustling for money pretty quickly which is what I think your "Not if it stays in the market you haven’t!" is alluding to. The problem is that any normal person has to call stop sometime if they don't want to work until they drop and they also have to stay in the market meaning some risk to achieve it. Cash is certainly not going to help unless you have a "lot of it" as its just continually being devalued by inflation. “paranoid …. she can directly”: ooh, naughty disguised as nice. Thanks for the clarification, RIT. I think my point was is that everything seems very expensive at the moment, what with Spanish and Italian bonds having a lower yield than gilts, fund managers I know anecdotally saying “please don’t give me any more money as what can I do with it” (not just the “active” mob, either), discounts narrowing hugely on investment trust shares, certain sectors of the property market, ever increasing personal taxation, blah, blah. As an IFA, I’m finding it increasingly hard to be confident in recommending what might be called “at risk” investments to novices and have been communicating with certain long-standing clients about considering taking a few profits in their SIPP portfolios. Although that goes rather against the grain, as I don’t believe in market timing, as such, I feel it must be done (with a wary eye on the FCA and our PI insurers! Excellent blog, by-the-way, and thank you for your courtesy. I think HL are losing clients to cheaper brokers and therefore have to push for cheaper alternatives to active mutual funds or, at least, convince people that they’re cheaper. It’s quite annoying though how they push for funds they get more money from, e.g. Neil Woodford Fund, where they mentioned the incredible negotiated OCF of 0.6% but forget to mention the charge of 0.45% on top of it. The same applies to all the articles (especially Mark Dampiers’, head of research) where they advertise incredible funds that will beat the market without mentioning the total cost of owning it at HL. The customer service is really good but it doesn’t justify the costs. But a beginner doesn’t know it and goes for the most expensive solution, they know this. Thanks God, Monevator exists! I have a range of HSBC and BlackRock index trackers sheltered in a TD Direct ‘Regular Investment’ ISA with new purchases made monthly. Each is of the accumulative variety yet I have yet to see signs of any dividend action (I track the folio with a spreadsheet so I know they’ve not simply been reinvested automatically). Any ideas what might be happening? If you think the customer service is good at HL try leaving them, it’s a very different experience. @Cowboy: this is going to be my next step. What is your experience? I’d like to know this too. I also have acc units and would love to know what proportion of any increase is from dividends. Thanks, that’s really useful, keep up the good work. I guess if you have a platform that doesn’t charge for dividend reinvestment then INC units would make it much easier to see the level of income you get. Just looking at my statement from one of my investment trust plans and it is very rewarding to see the dividends received to show you’re on the right track. Are there any disadvantages with INC units – other than more admin to keep track of what you hold? Yes, agreed, it is very rewarding to see the divis trickle in. I just use the method outlined in the article to track my accumulation funds and record the ‘wins’ on a spreadsheet. No disadvantages with inc units other than charges to reinvest and the temptation to not reinvest at all! I just looked up Charles Stanley for the Blackrock Emerging Markets D Fund, the OCF is 0.96% instead of 0.28% as shown above. Am I looking at the wrong fund? Hello, I’ve just found your website – thank you! I am hoping to invest a lump sum of £5000 and then top it up throughout the year. I think I have decided on my investment strategy etc so I am now deciding how much I can afford to contribute each year. How did you come up with the initial £750 and then decide when/how to increase it to £850? Realistically, I won’t be able to contribute as much as I would like in the short term due to a significant upcoming bill which needs cash savings, but I would aim to increase the investment amounts over time. I have defined benefit pension schemes and OH has a private pension so this is not our only retirement savings. The rise to £850 was based on upweighting the £750 by the last few year’s worth of inflation rises. I should have been upweighting the contribution by inflation every year. The original £750 was a notional quarterly figure that really breaks down to £250 per month. The idea was to show what’s possible with a relatively low contribution.